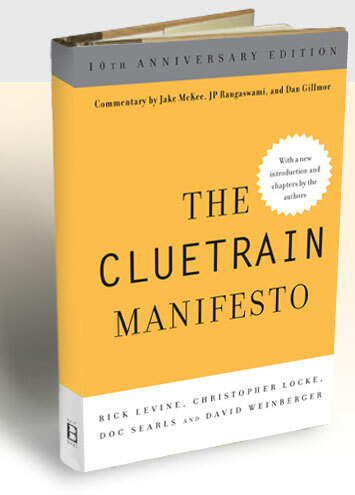 The Cluetrain Manifesto, by Rick Levine, Christopher Locke, Doc Searls and David Weinberger, is rather popular with the higher education web community, and has been for a long time. The book has been heralding the “end of business as usual” for more than 10 years now. When I saw that a tenth anniversary edition had been published in 2011, I knew it was time to dive in. The book begins with the 95 Theses of the Cluetrain Manifesto. These range from “markets are conversations” to “companies need to lighten up and take themselves less seriously” to “to speak with a human voice, companies must share the concerns of their communities.” Even though these theses are more than 10 years old, they still ring true today. This book is all about how the Internet – and the connections it enables – has changed business. – Speak in a human voice. – Get it out there first, don’t wait until it’s perfect. – Open up and let people see what’s really going on. If you’ve read Seth Godin, Eric Karjulato or any number of other writers, you’ll notice similar threads as you read this book. As soon as the Internet was born, real conversations opened up online. Instead of reading official publications and corporate manuals, people began sharing experiences and opinions rather freely. The authors call for companies and the people who run the companies to stop hiding behind sanitized press releases and shiny brochures. They want the real people inside, whether executives or worker bees, to come out and play. Now get out there! If you haven’t investigated Slideshare yet, now might be the time to do so. When I was looking at options for posting presentations online, I looked into Google Apps, Slideshare, Scribd and a few other platforms. Thanks to a nice user interface, the Slideshare Pro option, and the social functionality, Slideshare won out. I upload presentations and reports to our channel and then embed the presentations on our website where appropriate. What I didn’t foresee, however, was the added benefit that many see Slideshare as one of the industry standards. For example, when I posted a recent report on our Slideshare channel, several blogs and online media outlets picked it up. One of the outlets that shared the report seems only to share Slideshare presentations. Presentations and reports also get broader exposure than they otherwise might when posted on a platform like Slideshare. For example, the same report was featured on the Slideshare homepage the day after we posted it. I don’t know who all of the 6,000 viewers might be, but I’m sure our report has been skimmed or read by a different (and perhaps much larger) audience than it would have been if we had only posted it on our website. Have you looked into Slideshare or other similar platforms? What other benefits or weaknesses have you identified? Once you’ve landed on a starting approach for your organization’s social media efforts, it might seem like a hassle to continually evaluate new social platforms as they emerge. But continuous evaluation means the opportunity to say yes or no as each new opportunity arises. And even if a particular platform doesn’t fit well with your organizational communications or social media strategy, you’ll still need to know about most of the latest social media options. After all, you want to be prepared in case your colleagues come to you for guidance as they consider trying new platforms for their own projects or for professional development purposes. As a case study, let’s consider Google+. The platform became available to individual users in June. Then, in November, Google opened it up to brands and organizations. If the recent announcement of new facial recognition functionality is any indication of Google’s plans to continue developing the product, then Google+ is worth evaluating. Even if you decide not to incorporate Google+ into your social media plan today, you’ll still want to keep an eye on if and how they continue to tie Google+ content into Google searches. For now, the main way is through Direct Connect . But in the future, I certainly wouldn’t be surprised if they were to give Google+ content higher search rankings than other social media content. Have you evaluated Google+ or other emerging social platforms? Which ones made the cut? Convincing your team members to blog can be challenging. Whether they’re short on time, skeptical about blogs or hesitant writers, it’s tough to keep a consistent blog calendar without support from your team. But even if your colleagues aren’t jumping to contribute posts, a little creative thinking could increase the quantity of material at your disposal. When your request for written posts don’t pan out, try video. Conduct a video interview with a colleague and work the clip into your post. Or, if the video interview is mediocre, work from the video interview to ghost write a post. Make sure to incorporate quotes from the video, which will add some variety to the tone of your blog. Now that you’ve chosen which social platforms will fit your community well, it’s time to get going! Sign up for accounts on each of the platforms you’ll be using, and make sure you take a look at the Terms of Service for each one as you begin. If possible, use a general institutional email account to sign up and don’t use a personal password — take the time to create a new one. Make sure to document your account information so your colleagues can access the new accounts if need be. Also, try to keep the handles for your accounts consistent across platforms. Don’t call yourself ABC University on one and ABCU on another. Your organization’s communications style guide should help guide how you name the accounts. Check your account at least once each day. Assign a student or colleague to help you if appropriate. Post something (tweet, post a photo to your Facebook page, save a social bookmark, post a video, put a blog post up … you get the idea). Respond to anyone who interacts with you. Answer questions, congratulate people on news they share with you, suggest resources that might interest them, etc. Match your profile to your existing organizational identity. Refer to that handy style guide and use it to customize your profile colors, profile photo and description. This is a priority because it helps your community intuit that the account is an official part of your organization. Be consistent. Help people know what to expect from you. For example, you could commit to tweeting three times each day, posting something new on your Facebook page three times each week or publishing a new blog post each day. Tell your community you’re trying something new. Add links to your new social presences or channels on your institutional website. Use one social presence to point to another presence (e.g., tweet about your latest YouTube video). Include a blurb in your alumni magazine or admissions email newsletter. Reach out to colleagues who are already on those platforms and help them understand how they can support your efforts. Reach out to any unofficial accounts that relate to your organization. If you aren’t on a popular platform yet, then some enthusiastic student has likely taken it upon herself to represent you. Instead of griping about it in team meetings, reach out to the person who runs the account and help her understand how she can help you. Report back to your team. Share some early stories about how it’s going, and help them understand how they can become involved. At the very least, reporting back might help your colleagues think about content to share with you or other people who might be interested in what you’re doing.